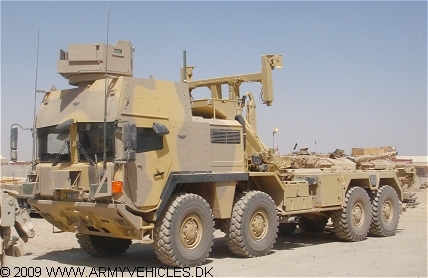 Danish Army Specific: it is understand that 20 vehicles have been delivered. Historical: As for the MAN 32430. Length: 10.52 m (410 inches). Height: 3.92 m (153 inches) (without load). Weight: 32.000 kg (70.400 lb.). Engine: Own 6-cylinder, type D 2066 LFG01, 10.518 cm3 (641 cubic inches) displacement, turbo charged, inter cooler, liquid cooled. Horsepower: 443 at 1.900 rpm. Transmission: 8-speed ZF type 6 HP 902. Transfer case: 2-speed, type VG 1600/2. Fuel capacity: 400 liter (88 gallons). Range: 400 km (250 miles). Additional: ZF power steering. ABS. The cabin which is known as the "IAC - Integrated Armoured Cabin" is CBRN-protected and has air conditioning and Eberspächer heater. CTIS-system. The cabin is certified to STANAG 4569 Level 3 (ballistic) and Level 3 (mine blast).